Interested in a different National Park? Contact us to learn about designing your own custom adventure! 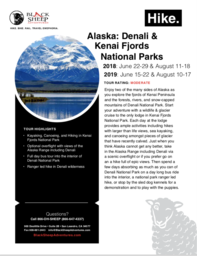 Enjoy two of the many sides of Alaska as you explore the forests, rivers, and snow-capped mountains of Denali National Park and the fjords of Kenai Peninsula. Start your adventure with an all day wildlife & glacier cruise. Spend another day exploring the region on water on a rafting trip along the Kenai River. Just when you think Alaska cannot get any better, take in the Alaska Range including Denali via a scenic overflight or if you prefer go on epic hike in Denali State Park. Then spend a few days absorbing as much as you can of Denali National Park on a day long bus ride into the interior and a hike in search of resident wildlife, or stop by the sled dog kennels to learn about this vital mode of transportation still used by the rangers today. Just 10 minutes away from the airport this hotel is a great place to stretch out after your full day of travel to Anchorage. Owned and operated by the Seldovia Native Association their culture and artwork from their home in Kachemak Bay region is woven into the design of the hotel. On the banks of Resurrection River, just south of Exit Glacier, this quaint lodge features casual rooms with log-cabin-style furniture, free Wi-Fi and flat-screens with DVD players, plus microwaves, minifridges and great views right out your door. Set on a ridge above the small community of Talkeetna on the south side of Denali, the Talkeetna Alaskan Lodge offers unforgettable views of Denali and the Alaska Range, yet just minutes from adventures of a lifetime.. The Denali Cabins are made up of 46 individual cedar cabins that are comfortably heated and appointed with private baths and blackout curtains for a peaceful night's sleep. All cabins come well-appointed with Wi-Fi, telephones, televisions, and private baths. Interested in a boat journey in Glacier Bay National Park? Inquire here for more information.